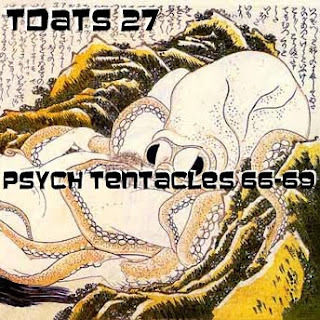 Volume 27 of TDATS: Psych Tentacles, features 60's heavy psych, pure fuzz and wah worship! The Amboy Dukes were the starting point for Ted Nugent, and Art were the original version of a band you may know better, Spooky Tooth. The Bluestars were an NZ band with a cool 60s punk snarl, similar to The Who. The Attack had a revolving line-up and at various times featured musicians who would go on to The Nice, Atomic Rooster, Andromeda and The Marmalade. Mind Garage are touted as one of the first "Christian Rock" bands, not that you'd notice anything very religious in their sludgy sound and offers of clothes-tearing here! The Bonniwell Music Machine (aka The Music Machine) had some chart success in the US, as did The Sparkles, who were produced by Roy Orbison's drummer, Larry Parks. There is an interview with The Open Mind's bassist Timothy Du Feu here at Psychedelic Baby webzine.